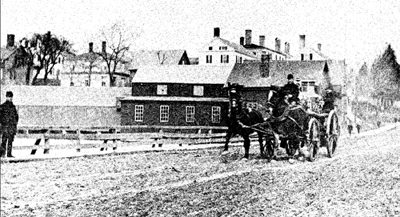 Bath Fire Department 3 clatters over the frozen surface of Washington Street… At the left are the buildings of the Rope Walk, where long strands of manila were woven into hawsers to be used by the local shipping industry. Since 1973 the Cabin Restaurant has been serving our local and far away friends. We feature the only real hand-tossed pizza in Maine and are proud to serve good food and warm spirits in a rustic, nautical atmosphere. We are located in an historic building in the south end of Bath across from Bath Iron Works. The front section of the restaurant was once a rope mill in the historic shipbuilding days. A model of this can be seen in the Maritime Museum just down the road from us. The building has also been a barbershop, ice cream parlor and a sandwich shop. Please stop by for a wonderful meal.